There was only one car with which Ferrari were going to top their F40 - the F50! In fact, it was less of a flat-out racer than its predecessor - providing its passengers with more by way of comfort. That said, the F50 was still far from luxurious. Especially, for a car that retailed at £330,000. But, the leather-covered carbon-fibre seats, at least, were a nod in that direction. And, at the front, the spring/damper set-up was transverse - rather than longitudinal - to allow for extra leg-room. The F50 gave a smooth ride - given its performance prowess, and the 'firmness' of its computerised damping system. The V12 engine - and 6-speed 'box - delivered usable power. And the combination of titanium uprights, magnesium wheels and all-metal ball joints produced ultra-precise steering. With a top speed of 202mph - and lightning-quick reflexes - the F50 was, in effect, a race/road hybrid. Its 5-litre motor, for example, made a heady 521bhp! The 5-valves-per-cylinder V12 had its roots in 1990's Ferrari 641/2 F1 car. Peak revs for the road-going unit, though, were 8,500rpm - rather less than the 14,000 of the GP racer. But, with chain drive spinning its quad overhead camshafts - the F1 car used gears - the noise from the road car was still ear-splitting! Just 349 F50s were built. 'Health and safety' may have thought that a good thing! So, the F50 was technically awesome. But, of course, a true supercar needed styling to match. Up to the plate stepped Pininfarina. The esteemed Italian design house unveiled a visual feast of tastefully-placed lines. Ducting was particularly delicious. Cowled projector headlights lit up the F50's front-end. Inside, the LCD instrument panel was straight out of F1. The F50 was even fitted with a 'black box' flight recorder, for goodness' sake! For sure, it was track day-inclined ... brakes and suspension were both race-derived. 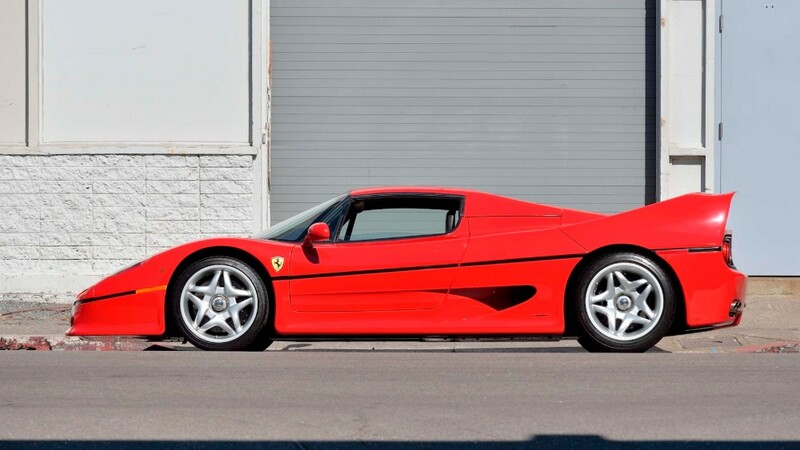 But, give it a road with enough scope - and the Ferrari F50 could unleash a lifetime of thrills in a single drive.